Winter is never easy for city wildlife, but for the smaller birds that overwinter in Brooklyn, this winter has been truly harsh. The weather has gone from chilly to frigid to downright mean-spirited at times. Snow isn’t necessarily a deal breaker for birds in search of food. Fluffy, wind-blown snows leave bare patches of earth exposed, and even little sparrows can kick a thin layer out of the way while foraging for tiny seeds and insects. But mid-February’s storm of snow and ice sealed off vital food sources. A hardy group of winter birders still saw 19 species in the Garden on one outing earlier this month, but the number of birds was much reduced from previous years, and those that were seen seemed to be hungrily searching out what food remained. A northern flicker was an unexpected surprise in that frozen landscape. More than any other woodpecker in our area, the flicker specializes on one food source, and that source is ants! In fact, it's common to flush the flicker from its favorite meal while walking through the Garden in warmer weather. The "flicker" of its yellow underwings and the white spot on its rump make the bird easy to ID, even at a distance. On mild winter days, flickers somehow seem to find some active ants, but in the dead of winter, with the entire landscape frozen, this isn’t easy. This flicker, one of the few remaining in the Garden, must be making do with berries and seeds along with whatever insects it can find. Just west of the Steinhardt Conservatory stands a collection of trees in the family Fabaceae—the legumes. On this day, a large flock of European starlings found their meal ticket there. Forty or more were stripping the trees of the thousands of small seedpods hanging along the bare branches. Periodically a dozen or so would fly to the ground to pick up stray seeds and pods. It seemed as though very few seeds would evade these determined nonnative birds. As for the larger overwintering birds—we saw peregrine falcon, American kestrel, and sharp-shinned hawk that day—they have a food source that is present year-round: the smaller birds! Bradley Klein is a journalist, social media producer, and adjunct professor at Columbia University's Graduate School of Journalism. He leads nature programs for BBG, New York Botanical Garden, and the American Museum of Natural History. I enjoyed watching the starlings peck at the pagoda tree pods. I grabbed this photo of one. Funny, but the starlings seemed to prefer the pagoda tree, and the robins preferred the cork tree. 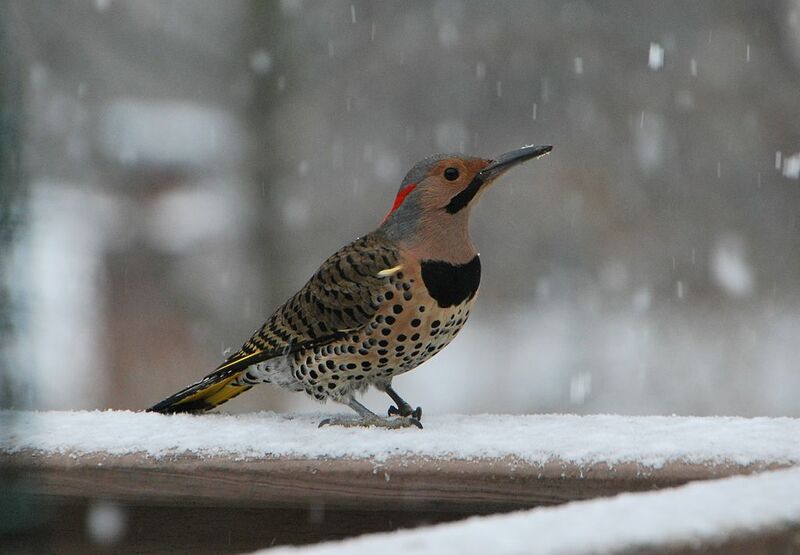 What's an ant-eating bird like the northern flicker to do for food during a winter as harsh as this one? Photo by Ted via Wikimedia Commons.